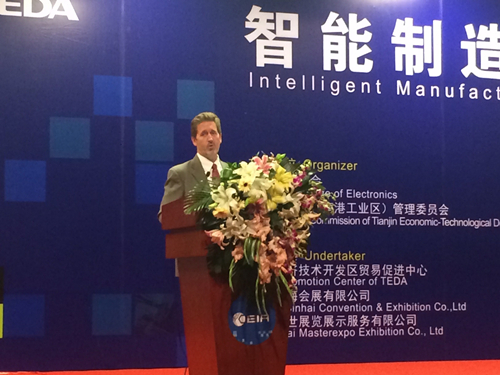 October 30, 2014 – Universal Instruments participated in the Intelligent Manufacturing Industry Development Forum at the China Circum-Bohai Electronics Manufacturing and Intelligent Automation Exhibition (CEIA) on October 22 in Tianjin, China. Glenn Farris, Universal Instruments‘ Vice President of Marketing, presented to the group, providing his viewpoint on the evolution of the electronics market landscape. Other speakers included Craig Chen, China Representative of the Manufacturing Technologies Association UK; Changyi Chen, Academician of China Engineering Academy; Jianrong Tan, Chief Information Officer of the Second Institute of China Aerospace Science and Technology Corporation and key member of the National Cloud Manufacturing Project, Xudong Chai. It is very good to be here with you today to discuss the future of automation. Thank you for the kind and warm welcome. It is very good to be here with you today to discuss the future of automation. Thank you for the kind and warm welcome. My name is Glenn Farris. I am the Vice President of Marketing for Universal Instruments, a leader in advanced automation solutions for electronics and light mechanical assembly. It is very appropriate to be having this discussion this year, the year of the horse. The horse was one of man’s first attempts at developing and harnessing tools to automate our work and improve our lives. In today’s globalized interconnected economy and culture, the need for automation has never been greater or more urgent. In my presentation I will discuss with you some of the key trends we see in manufacturing, some of the applications which are driving challenges in the way automation is utilized, and how Universal Instruments is working with customers and technology partners worldwide to develop solutions to these challenges. First, a little information about Universal. Universal is the founding company of electronics assembly automation. We started this business as a joint venture with IBM back in the 1960’s in New York State. The original motivation for automating electronic assembly then is no different than today, labor availability. At that time, IBM was growing rapidly. The labor pool could not expand at the same rate as IBM, and they needed a way to replace labor with capital. Universal worked with IBM and developed the very first systems for automatically inserting components into a printed circuit board.Today, automation is ubiquitous in manufacturing, whether it be semiconductors, electronics subsystems, or mechanical assembly. We are very proud of our heritage at Universal, and at the same time very humble. We recognize that our value is completely driven by how well we serve our customers and enable them to improve their own manufacturing processes. Every day we strive to learn the key challenges our customers face, and we work to provide advanced solutions, based on technological innovation. These solutions enable industry to manufacture with higher quality results “ build better”, while increasing throughput “build more”, and in the end reducing overall cost of assembly “speed less”. So, what are the key macro trends I see. First, it is clear that labor is a scare commodity. All around the world, not just here in China, skilled trained labor continues to be more expensive and more scarce. The life cycle of new products continues to reduce, meaning that massive numbers of people are needed to ramp a new product into high volume in a very short time period, and the need for these employees may be temporary, as little as 6 months in many situations. It is a challenge for employers and stressful for employees to adapt to this type of situation. The opportunity for dislocation is fierce. Too many potential employees when and where they are not required, too few when they are desperately needed. Second, in electronics the miniaturization of components and the intricate nature of the end product makes it very difficult for people to build assemblies with high quality. This is especially true for several of the most advanced and rapidly growing types of applications. Third, technology advances, such as the often discussed “internet of things”, means that manufacturing is becoming more intelligent, more aware of the overall process, more adaptive to changing conditions. When every tool on a factory floor is networked together and communicating with each other, quality improvements will happen in real time. Process changes with occur to optimize yields and throughput. Some people worry what will happen to all the labor that is no longer needed in such a situation. Will unemployment increase? Will there be social unrest? Personally, I do not think so. The evidence of history is against this. Every step in automating labor drives a need for a more educated workforce. People become more productive, so the economic value of their work increases and a higher wage is supportable. People enjoy work that requires them to use their brain and smarts on a level equivalent to their capacity. They are happy, more satisfied and enjoy a higher standard of living. The global economy can continue growing faster than the labor pool only if these productivity improvements continue. Regionally, there are still large variations in labor rates and availability. The bulk of manufacturing will continue to be based in Asia. China continues to be the most rapidly growing economy if you look at the total change in economic value output. A growing middle class here drives the largest increase in consumer activity in the world. Given the already robust supply chain in place, this combination of local demand and supply chain means roughly 50% of electronics assembly will stay here in China, and 75% will stay in ASIA. Regional growth will certainly occur in Mexico and Eastern Europe, but this is for the small number of “localized” assembly operations which will continue near the U.S. and EMEA, primarily for political or development partner responsiveness issues. What is really fascinating to me is the type of applications we face in the future that will require automation. Technology is evolving rapidly and continues to make our lives better: healthier bodies, socially inter-connected, cleaner and safer transportation. Speaking of medical, here is a picture of a microscopic catheter for inserting into the human vein to search for damaged tissue. To build such a device required advances in assembly processes and technology that did not exist 5 years ago. Universal partnered with the developer of the product concept, defined a process to enable manufacturability, and developed the production line to assemble it cost effectively. This model of solutions development and close collaboration between designer, manufacturing process developer, and equipment vendor is something I believe to be key to future successful products. Smart devices, especially phones, have been hugely popular and transformed the world and how we interact with it. Today, communications technologies that were once the province of ultra-wealthy business people are now in the hands of Yak farmers in Mongolia, teenagers in Beijing, and old ladies in Kansas. Now, the next evolution of smart devices is on our doorstep, as wearable electronics are set to take the stage and command the bulk of our purchases in consumer electronics in the next 10 years. Whether Google Glass, or Apple Watch, or a host of any other products out today are successful is still in question. But, what is certain is that products like these will become as essential to daily living as our cell phone is today. These products drive very complex assembly requirements. Combined with the need for low cost, these applications demand highly automated assembly solutions. Next, the automobile. Rapidly growing in demand here in China, the car is one of man’s favorite goods. Assembly automation has helped take the automobile from something only the wealthiest could afford to something that is becoming common in most households. China is now the largest market in the world for automobiles, and the range of vehicles is growing rapidly. Just this past week I even saw 3 Teslas on the road in Shanghai. In the not too distant future, say 10 years, I predict that autonomous vehicles will take center stage and become the vehicle of choice for many people. Safe, convenient, and smart, these vehicles will create the need for new types of automation. They will be packed with sophisticated electronics, sensors, cameras. Beyond these categories which can be understood today, I suspect that the “internet of things” will create other applications that drive automation challenges that few can imagine. This has always been the case in our technology driven world. Examples of other likely areas driving automation challenges include smart homes, smart traffic control, smart utilities, renewable energy production and storage. So, I’ve discussed the macro trends and I have highlighted what I believe to be key applications with will drive assembly challenges in the future. Great. Now, the real question is what type of solutions are needed? At Universal, as I mentioned at the start, this is the question I and our teams continuously ask ourselves. We partner with our customers to realize the answers. At the highest level, our view is that it boils down to cycle time to bring solutions to market. Of course any solution that provides economic value must have a positive return on investment (ROI) vs labor. That is the most fundamental, but simplistic point. Increasing product volumes and product types presents a much greater challenge. Take the smart phone as an example. In 2007, there was only one, the original iPhone. 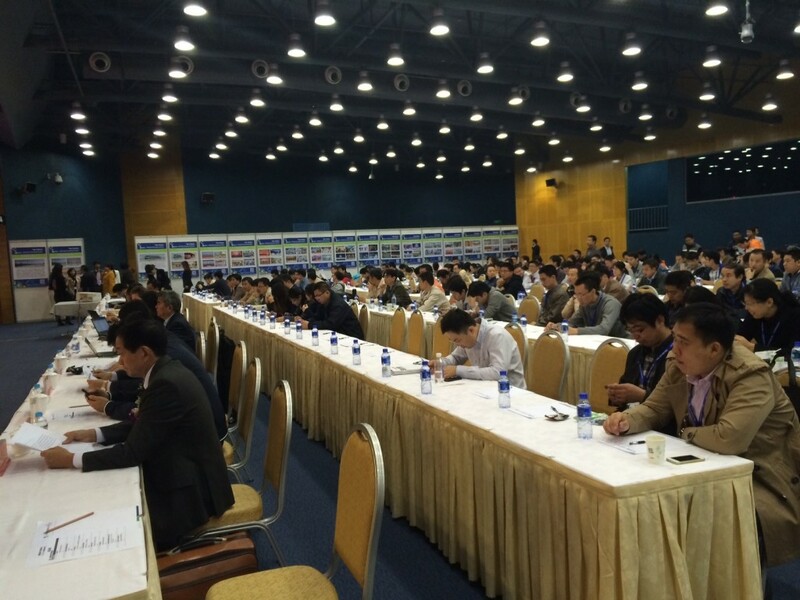 Today, there are perhaps several dozen suppliers of smart phones, and 100 models on the market. In just 7 years. Amazing. Think about the discussion from the previous slide on the proliferation of other smart devices driven by the internet of things. We are looking at 1000’s and 1000’s of products, ramping up and down in volume in months, replaced by other products following the same ever shortening live cycle. Automation cannot keep up if it is dependent on fully customized, highly engineered solutions. There are not enough highly skilled designers on the planet. Instead, solutions need to be based on highly flexible standard platforms that provide low cost, multifunction tool sets and modularity to enable rapid redeployment for new applications. Now, instead of engineering complete platforms, dedicated applications tooling is all that needs to be customized. This is analogous to the challenge of ramping up and down labor I mentioned at the start of my talk. If we replace highly cyclical labor demand with highly cyclical design engineer demand we really have not made much progress. However, intelligent multifunction automation platforms, with simple software programmability and tooling changes can allow for minimal engineering effort and rapid change over for new applications. This is where we see the future of automation and the solutions to enable the continued growth of our global economy. I want to thank you all for your time today. If you have any questions or want to discuss further, I would be very pleased to speak with you after this session. Thank you. Let strive to use the inspiration of 2014, the year of the horse, as we work together to realize the future of manufacturing automation. Prev:Are Your SMT Machines ESD-Safe?